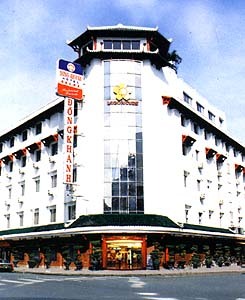 DONG KHANH hotel, 3- stars hotel with over 50 years reputation, is a member of Saigontourist Holding Company, is the perfect combination between Chinese elegant structure and Vietnamese traditional hospitality. The restaurant with "Buffet Lunch" offering the Chinese traditional dishes, and all-purpose meeting place system, modern appliances, is an ideal prestigious place for holding meeting, other parties for organizations. Banquet facilities for up to 1000 guests, are specializing the fantastic and colorful wedding ceremony with attractive promotions. Professional and rich experience staff, your wedding party will be celebrated in the most solemn and cordial atmosphere. However, the multiform of Dong Khanh restaurant drinking and eating made the different with all the others restaurant in area by the combination of outstanding Cantonese dishes and the traditional Vietnamese cuisine.